ParisDailyPhoto: Poor Pont des arts ! I went to Le Pont des arts yesterday because it's a lot in the news at the moment. The thing is that because of the tourist season there are so many "love locks" on the bridge that the panels are collapsing more than usual. 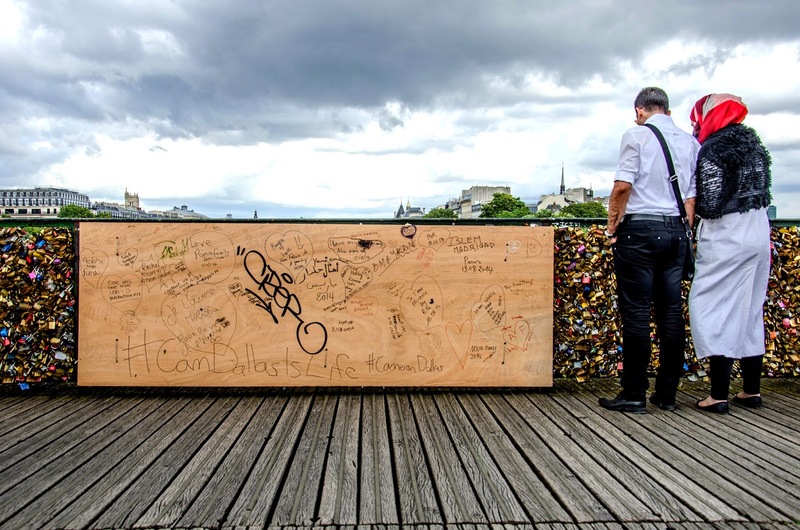 To prevent people from adding more locks, the Paris town hall hopes to get the lovers to take selfies and post them on the social networks (and the Paris site Love Without Locks). They also put stickers on the pavement at the entrance of the bridge. Will it work? I doubt it, especially since there are about 10 people selling locks on and around the bridge! I am feeling compassion for this iconic Pont des arts and I like the title : 'poor Pont des arts'. Sick of too many love locks or is it too much business that killed the original thing... ? Too bad. I'm feeling sorry for the bridge- and any bridge having that subjected to them. Pure vandalism. I really wish people would practice responsible tourism and not trash the places they come to see. This is so very sad. I'm glad those women are making a big issue out of it. In any other country, the lock sellers and lovers would be fined. Here they just put "please stop" stickers on the ground which have already been removed! Why doesn't the city hire an out-of-work young person to clip the locks? It would cost less than repairing the bridge a few times a year. And didn't they erect a trellis for locks on some other bridge? Or the city could actually sell the locks and keep the keys, take and official picture, unlock the locks at the end of the day, and resell them the next day. Revenue for the city. Souvenir for the tourists. Bridge kept beautiful. I agree with Sasho, clip the locks. Enough already! An alternative (although probably expensive) might be to remove the mesh panals and replace them with solid ones. That might just move the problem onto another bridge though. I think your idea of re-usable locks on one heavy duty panel...meant for that specific purpose is a great idea! That certainly would be have been enough for us. There are lots of ways to stop this practice—or provide other, safer places for the locks. Very special art, poor bridge. Have a nice weekend, here raining!